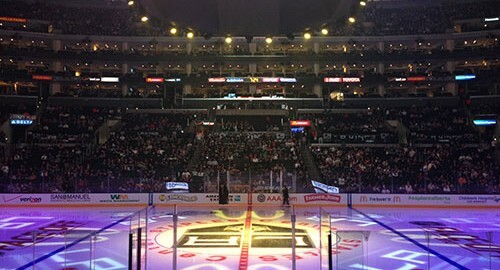 The Los Angeles Kings have taken the league by storm this year, and it has caused casual fans who are used to watching the game on tv decide that they would like to get up and attend a game. The question for these fans is what is the best seats in the house for them to be able to enjoy their experience watching the Los Angeles Kings? If you ask fans of the Los Angeles Kings, each person will give you a different answer as to what they feel are the best seats in the house. However I am here not to convince you of what I feel is the best seat in the house, but more to educate you on what the pros and cons of each seat at a Los Angeles Kings game is. 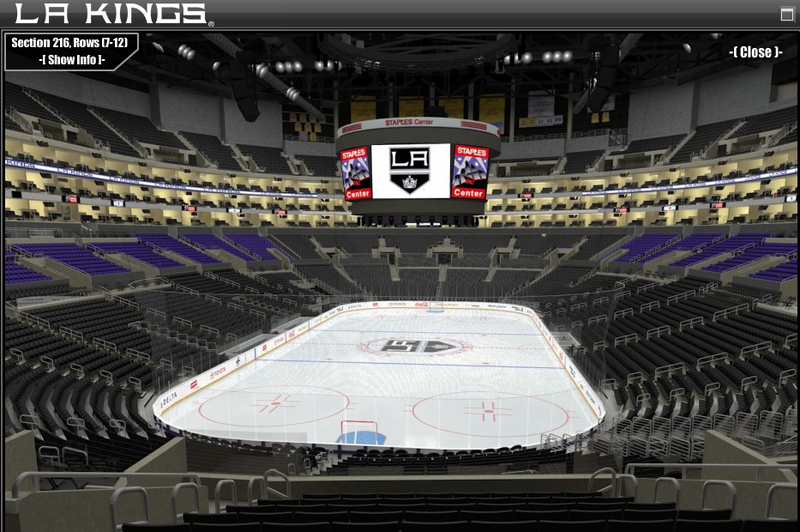 You can also see more FAQ about the LA Kings Seating Chart. LA Kings 300 Level Staples Center. 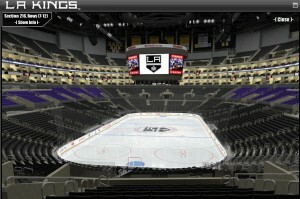 Let’s start with the 300 Level “upper level seats” at Staples Center. In the 300’s you have 34 different sections in which you can sit. 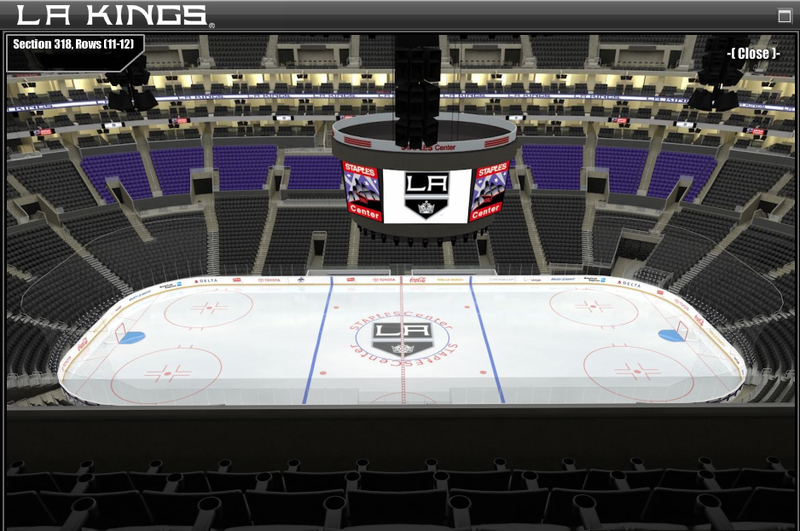 Sections 302-317 would be on the side where the Los Angeles Kings defend periods 1 and three while sections 319-334 would be the side where the Los Angeles Kings are shooting twice. With this in mind now ask yourself, what do you prefer to see? Do you prefer watching the Los Angeles Kings goalie play for two periods, or do you prefer to see the Los Angeles Kings offense at work for two periods? The other option you have is would you rather than have an equal view of both actions and sit center ice in Sections 318 or 301? That would be another option you have! Once you have decided what you would prefer as to whether watching the Los Angeles Kings attack twice or defend twice, you then get to decide would you like to be viewing from the blue line, a corner, or behind the net. Each view will provide you something different as when you are on the net; it enables you to see the entire rink and track the puck very well. It, however, diminishes your view on the opposite side of the arena and makes the players appear somewhat small on the opposite end of the rink. When you sit in a corner it will give you a bit better view of what’s happening on the opposite side of the rink while keeping you with an excellent view of the action happening right in front of you and typically it puts you right at the goal line so when the puck gets past the goalie, you have one of the best views of seeing the puck go into the net. By moving closer towards the blue line, your view of the action changes a bit as now when you are watching the teams attack offense you are now viewing them from behind a bit as opposed to having them come towards you. It lines you up to see plays being developed while also giving you a better view of the action on the opposite end. Los Angeles Kings Staples Center view from section 326. 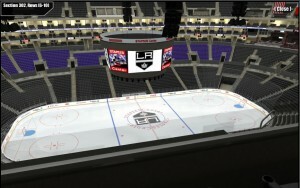 View from section 320 at the Staples Center. 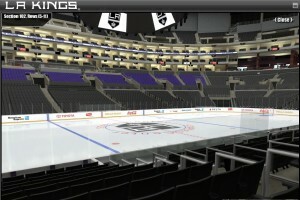 LA Kings Game 200 Level view Staples Center. 200 Level The next tier of seating would be the 200 and premier level seating. 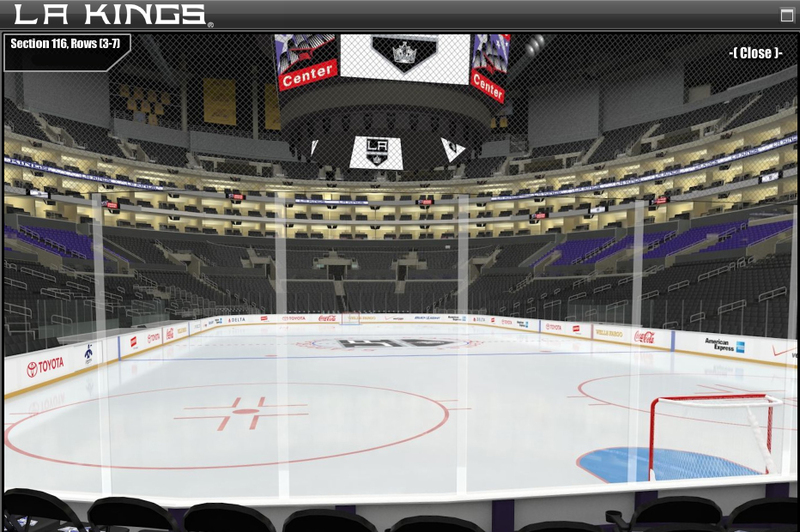 The 200 level seating at Staples for the Los Angeles Kings are seats that are located behind the goals and have a slight bit of elevation to them. The 200 levels give the fan that feeling of being low to the ice and having the action appear closer to them while not completely draining their wallet. The Average cost to sit in a 200 level seat for a Kings game during the regular season can start at around $55.00 per ticket. View from the 200 Level LA Kings Game Staples Center. LA Kings Game Premiere Level view Staples Center. The Premiere Level seats are between the goals and extend into the corners. The Premier seats have the bonus of coming with waiter/waitress service which enables you to remain in your seat all throughout the game and not have to worry about getting up to get whatever food or beverage you desire. The elevation in the premiers offers you some of the best sightlines for hockey as you will pretty much not have any part of the rink be hidden from your view. You are viewing the game from “above the glass” which means the Plexiglas boards that surround the rink will be lower than you so you will not be looking through that, you will see the ice clearly from every spot in the stands. 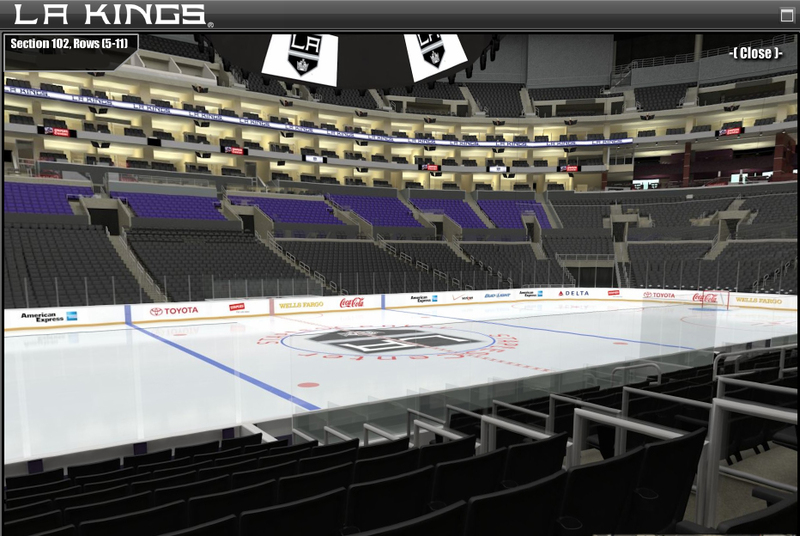 If you get a row 1 seat in the premiers, you will have what is probably the BEST sight-lines for a Los Angeles Kings game possible as you will not have anyone or anything blocking your view. If everyone stands to see a big play; you will have just enough elevation over them that you can remain seated in your place and still see the game in action. Premier level also has a bit more leg room which is a great feature for taller fans. Premiere Level can start around $110 per ticket for a regular season Kings Game. 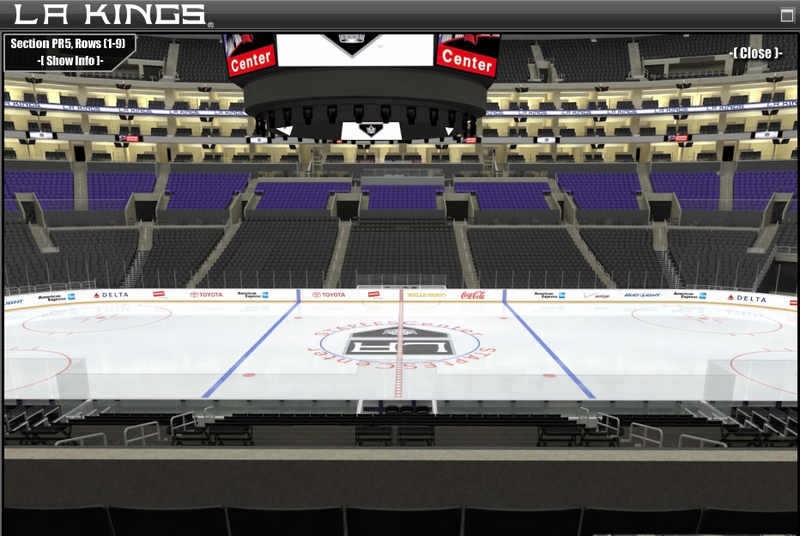 LA Kings Game at the Staples Center Premiere Seating Section 18 Row 6. Lower 100 Level Los Angeles Kings Game Staples Center. 100 Level at the Staples Center. 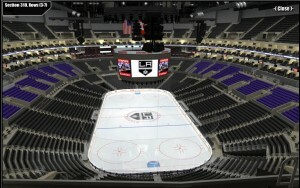 Next, up we have the 100 level seating at Staples. For many people, they feel that the 100s is the only way to go because they want to be as close to the action as possible. However, when you are this close, there are drawbacks. 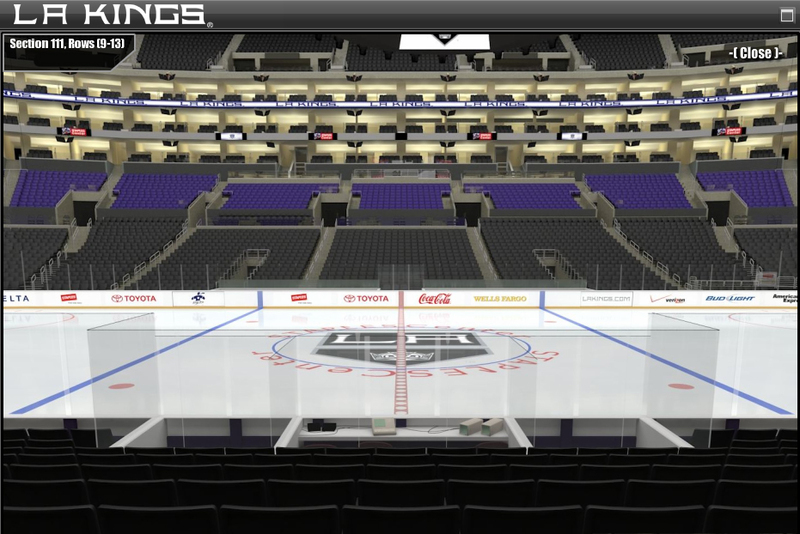 Pending on what section you are sitting in, you could have your view obstructed for certain parts of the ice. The lower you sit, the harder it is to see on the opposite end of the rink. If you sit low, you are going to have a very god view of all the action is happening in front of you, will be able to the ice scrape up from the player’s skates when they throw on the brakes. The chip in the ice that will cause the puck to bounce on edge, however by doing this you cut down on your angle to see the opposite end of the rink. You will now be sitting “below the glass” which means when you go to look at the opposite end of the rink, if you are in a corner or between the goals, you will need to look through the players bench, or the penalty box to see the action on the opposite end. As you move higher up, it opens up the angle a bit more and lets you see more into the corner on the opposite end of the rink. Typically if you want to sit low, you want to be behind the net as this will not cut off your angle as you’ll have a full view of the rink. However, if you sit low behind the net, it makes it tricky to see what is happening at the opposite end of the rink. You will be at eye height with the players so trying to see the goalie makes you feel like a player as you will see that defense trying to get in your way, along with the offense trying to set a screen in front of the goalie. If you’re a LA Kings fan then sitting in Lower Level seats in sections 116 or 117 give you the Kings coming at you twice during the game as the Kings shoot twice on that side. You never have to move your head side to side, and it gives you a good view of all the action in front of the goal and to the sides as well as getting to see the puck go into the net. In the lower sections behind the goals, you will also see just how much pushing and shoving goes on right in front of the goal as well. See Just how hard it is to be a goalie and have to see what’s going on in front of you when you have two or three guys pushing and shoving just inches in front of you. 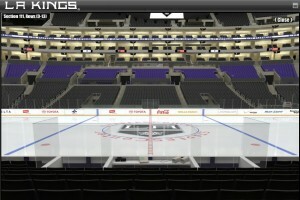 Kings tickets for the lower level behinds can start as low as $95 a ticket for regular season games. Sitting on the Glass for a Los Angeles Kings Game. Glass Seats also called ICE Seats. Many people see glass seats as the greatest thing in the world. With glass seats, you have to understand the pros and cons to them, though. By being on the glass, you are essentially a part of the action as you can pound on the glass, and when a player comes crashing into the boards, they are almost on top of you. However not every glass seat offers this. There are glass seats behind player benches and penalty boxes which mean you can’t hit the glass there, but you are right there with the players being able to hear what they are saying, what their coaches are saying to them. It gives a lot of insight as to what is going on in the player’s minds during the game. These will hurt your view a bit as you are looking at the backs of players heads during the game, however, with those seats, it is more about the atmosphere of those type of seats. LA Kings Hockey Game (HD) Front Row Staples Center Glass Seats. 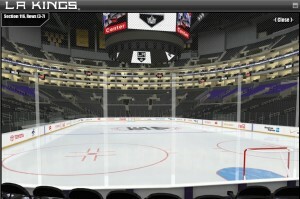 View from behind the Kings Bench Front Row Staples Center. I understand that other people will have different opinions on what each seat has to offer. However, my goal here was to give an honest, unbiased opinion on what each seat has to offer to fans who want to see the Los Angeles Kings play. Do you know how many Stanley Cups the Los Angeles Kings have won? 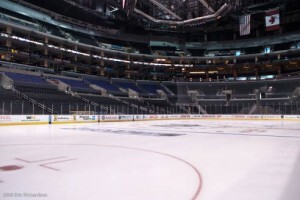 Get 10% off Los Angeles Kings Tickets at the Staples Center! 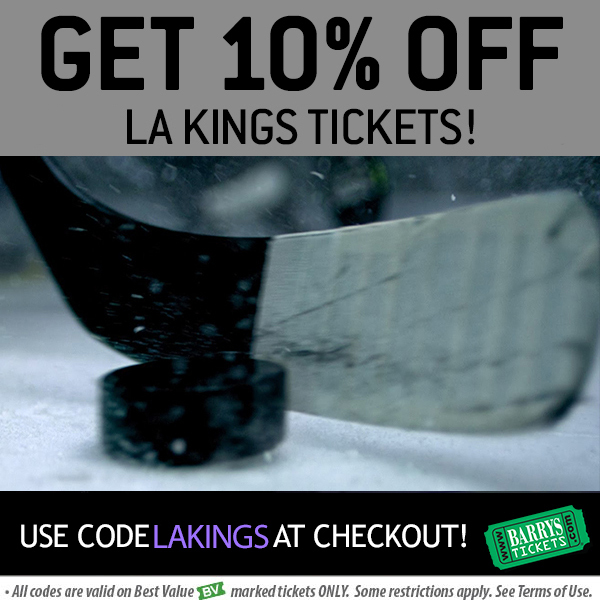 Use Los Angeles Kings Tickets Promo Code LAKINGS on tickets marked BV and get 10% off! 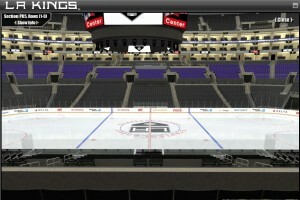 You can purchase Los Angeles Kings Tickets for all games at the LA Staples Center. Since 1999, Barry’s Tickets has been located caddy-corner from the Los Angeles Staples Center inside the Luxe Hotel. 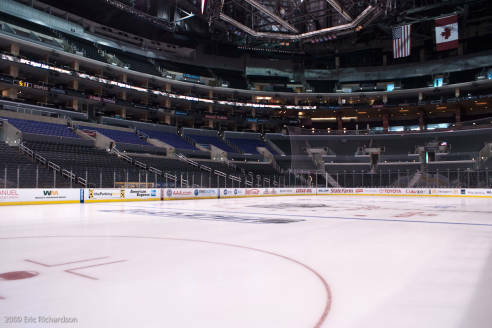 Our Los Angeles offices offer a fast and convenient location to pick up or purchase Los Angeles Kings tickets during the preseason and regular season as well as Los Angeles Kings playoff tickets even after the puck drops free of charge. You can check out all our current LA Kings Tickets Discount Codes to help you save on your next Los Angeles Kings home game. Being 6’6 I like to sit in the seats right in front of the Suites level. They are actual chairs that I can move back or forward. No one walks in front of me which I love. The view is perfect for Hockey because your high enough to see all the actual plays develop. I have sat their twice and loved every second of being on the boards. There is no better seat at a Kings game to see the fights and action. The sound of the Glass being hit, the vibration of the Glass its amazing. I love sitting behind the goalie where the Kings shoot twice, all the action comes to you and you dont need to move your head around. Pingback: Los Angeles Kings Tickets Discount Code Score Amazing Deals! Pingback: Do you know how many Stanley Cups have the Kings won?